It’s a throwback to what was once considered cool and sophisticated. 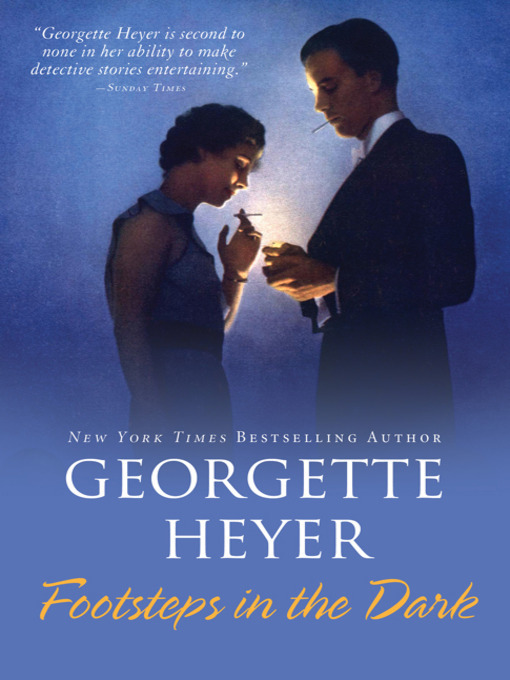 A man and a woman light up there cigarettes on this cover of Georgette Heyer’s 1932 novel. Though perhaps better known as a writer of Georgian and Regency romances, Footsteps in the Dark was Heyer’s first of several detective novels. Perusing through a selection of ebooks, this cover (also used for a print version) caught my eye. The man and woman, dressed in evening wear typical of the 1920s/1930s, are prominently featured on the cover in an indeterminate location, though the background color and hazy light are suggestive of a nighttime outdoor setting. The man holds his lighter ready to ignite the woman’s cigarette while his own cigarette awaits perched between his lips. It’s almost like a scene out of a Hollywood movie and instantly made me wonder if there was a connection between this novel and an Errol Flynn film. 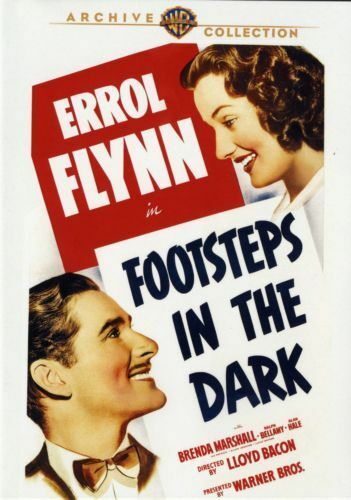 In 1941, Errol Flynn starred in a film titled, Footsteps in the Dark. Flynn plays an investment handler turned lurid detective novelist who becomes involved in a murder case. It’s long been on my list of movies to watch, but I haven’t had the pleasure yet. Turns out this movie, while not as successful as Flynn’s other films, was originally based on a 1937 stage play, Blondie White. The play is about the adventure of an author of detective novels who solves a real murder with his wife, and the titular character is a burlesque dancer involved in the crime. Two very disparate plots. One a lighthearted film involving diamonds, murder, and misunderstandings. The other a novel of upper English class types in a classic country manor setting. Both would be of interest to fans of mysteries, especially the amateur sleuth, cozy-type. While there’s no connection between the two, it’s interesting to note that the characters of the novel cover bear a passing resemblance to Flynn and co-star, Brenda Marshall, as featured on the DVD cover for the film. This is likely a result of the predominant style and fashion of the period though. Regardless, the novel cover drew my attention and interest which in turn led to a renewal of interest in the film, though unrelated. Perhaps it’s time both book and film moved up my to read/to watch lists.